I’m away at a blogging event today-the Stouffer’s Lets Fix Dinner Blogger Roundtable. So I’m pulling an oldy but goody from the archive. It is just getting to the season where we clean up and prettify our flowerbeds here upstate, so republishing this post on how I was able to get a ton of free landscaping mulch this time last year seemed very relevant! We had several trees cut removed at the Frugal Upstate household a couple of weeks back. Now Yankee Bill is a pretty handy guy when it comes to a chainsaw and all, but when it comes to pine and maple trees that are 4 or 5 stories tall, and impeded by buildings and power lines-well, it’s time to call in the experts. And a good thing too-the large pine was way taller than any bucket loader they had-a guy actually had to scale the thing toting a chain saw and cut the limbs off while clinging to the tree. It was entertainment not only for my household, but also apparently for the 5th grade social studies class that could see the guy out their classroom window from down the street! Yankee Bill came home and said “uh, you think you have enough wood chips?” Yeah-I think that will do me for a while! And the guys told me that any time I wanted more chips just to call the company and let them know-they’d be happy to drop me another load. Now of course this doesn’t look quite as regular as the store bought chips-there are some little bits of visible pine and various sizes of chips. Also they are fresh. That worried me a bit, so I did a little research on the web (my favorite place to be y’all!) to see if that effected anything. Apparently as new wood chips and sawdust decompose they use a lot of nitrogen. There was some concern in the articles that I read with it yellowing your plants if you didn’t add additional nitrogen. No problem-I had a bag of rose fertilizer I had purchased about 2 years ago. When I put the chips on any of the beds, I liberally toss some fertilizer on and sort of mix it around. As for the stuff left in the pile-I’m not worried about it-a year of being rained on and just plain aging will take care of the problem. Meanwhile the kids are using it like a huge sandbox/mountain. We’ve been taking more baths and showers than usual and I’ve had to pick pine out of Princess’s hair. So if you need mulch, an don’t want to spend the money on that expensive stuff in little bags-try calling your local tree cutting service. You may be able to either pick up free mulch or else have it delivered to your door for nothing! Oh, and I also read that you should never use fresh black walnut as mulch-it could kill your plants. So do inquire what types of trees are in any free mulch you get! *Note: My front flower beds are mulched with the remainder of the small truckload of mulch we bought last year. 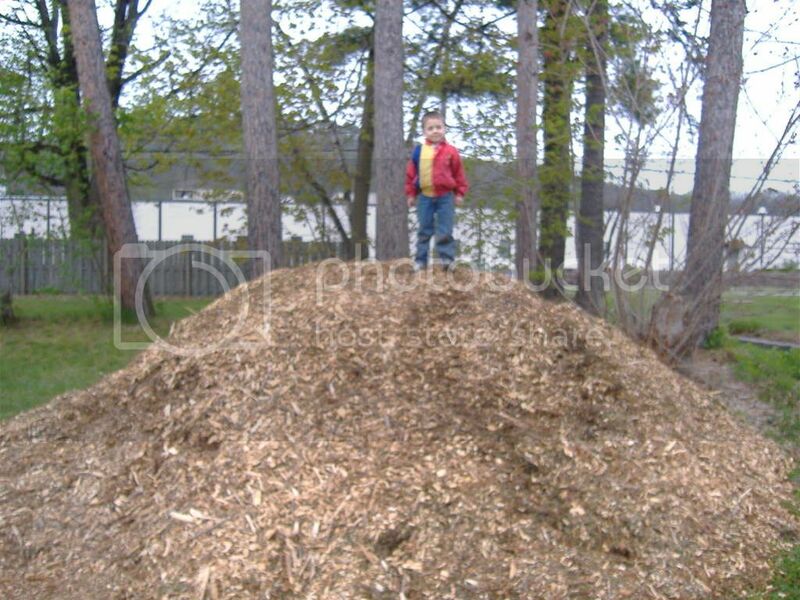 Yes, I actually had my poor hubby move a pile of wood chips from one house to another. Hey-we paid for that! Anyway, now the front of the house had a very nice 4″ deep mulching on it, without the worry about new wood chips. Very resourceful! I just was reading a book (A Long Trip Home by John Grogan) and someone in the book did the exact same thing with the tree cutting, and it seemed like such a good idea there too… it avoids waste, and the mulch is probably more natural than anything you would buy in a store.